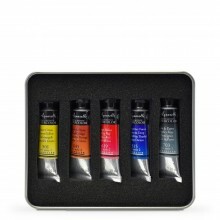 Dedicated to excellence, Holbein offers a 108-colour range of moist transparent watercolour of unsurpassed purity, permanence and brilliance in half pans, 5ml and 15ml tubes. 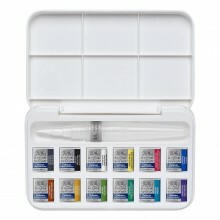 A European style transparent watercolour, Holbein watercolour also preserves the brush handling qualities inherent in traditional Japanese watercolour techniques. Without ox-gall or other dispersing agents, Holbein watercolour moves slowly permitting greater colour density and brush control. It is a colour line with a consistent creamy texture that remains smooth when dry without cracking, crumbling, chipping or moulding in the palette. It may be re-wetted easily like a pan colour when in tube form. Simply fill the wells of a suitable palette with the desired colour selection, permit to dry, then wet the colour when needed. Holbein watercolours produce brilliant transparent washes as well as powerful clean darks when used in more concentrated applications. 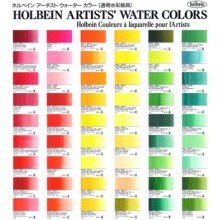 Engineered to surpass the quality standards set by both North American and European manufacturers, Holbein watercolour is widely preferred around the world for its handling qualities. Holbein watercolour ranks as the world’s finest.